ATHENS, Ga. – The Georgia football team scrimmaged for two hours on Saturday afternoon in Sanford Stadium under cloudless skies and with temperatures in the mid 60s. This marked the team’s first scrimmage of the spring. During the Bulldogs’ ninth session of the spring, the team suited up in full pads as the offense battled the defense in a variety of different situations and the special teams got some work. Smart mentioned the first team offense squared off against the second team defense and vice versa during the scrimmage. He also said the first team offense and defense had the opportunity to line up against each other during the third down, “red area” and two-minute situational drills. Defensively, Smart singled out two Bulldogs following the scrimmage. 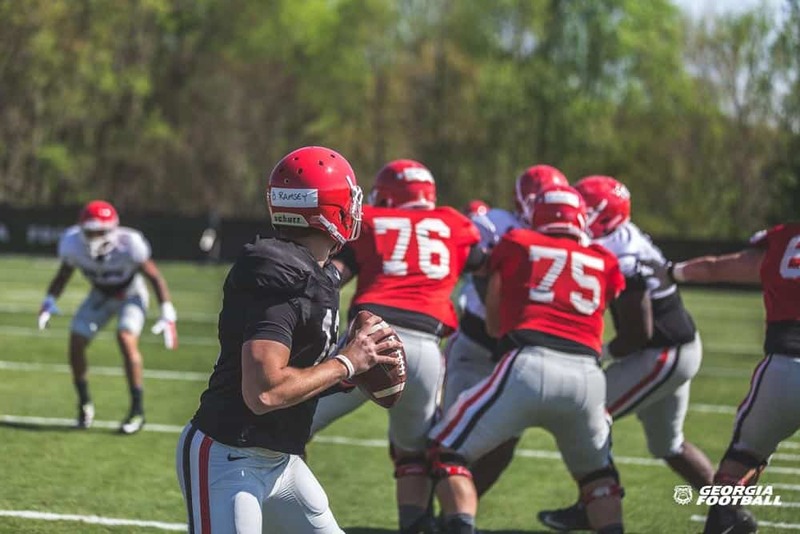 On offense, Smart said quarterbacks Brice Ramsey and Greyson Lambert shared snaps with the first team while early enrollee Jacob Eason took snaps with the second and third team offenses. The Bulldogs’ 15 practices will culminate with the annual G-Day intrasquad game on Saturday, April 16 at 4 p.m.